Our mission is to help you find a good fit that matches your skills, experience, and lifestyle. Whether we’re able to connect you with your next employer or just help with information, we’re there for you. We want to be a long term resource. We’ll send you a list of the companies that are hiring for the skill set that you request. 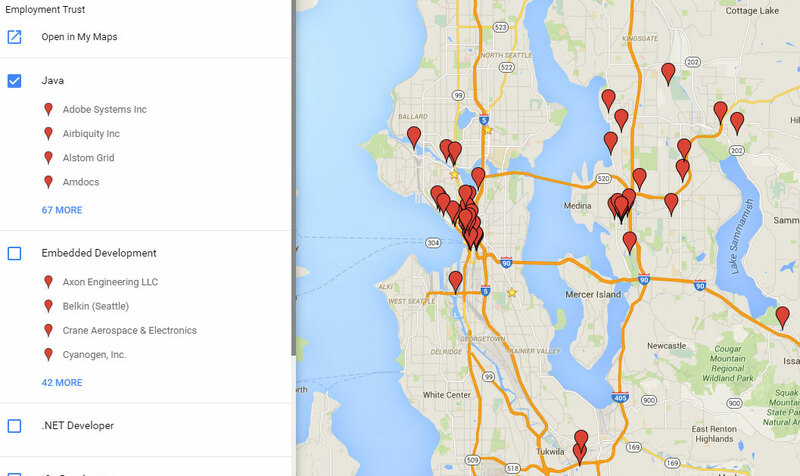 We invested long hours to identify and map out the top “Direct Hire” companies in Seattle and the surrounding areas. Our Seattle map has ~800 companies that we have recognized financially strong enough to hire full time technology employees as well as office professionals. In addition to this we have created an internal map of the targeted companies on the types of individuals they hire. This might be technology specific or title specific. As time goes on these categories are getting more refined, more specific, and overall better to help you find your next ideal opportunity. Any helpful information that you could provide to make this experience more robust for the user would be greatly appreciated. This would include video links, suggestions on what candidates would like to see or hear about or company culture would be examples. Actively looking or open to opportunities at the moment? Send your resume to jobsearch@employment-trust.com and a good time for an initial phone conversation. Open to opportunities, but don’t have a current resume? Whether you refer a candidate or a client we have a set referral fee tied to each placement. In the long run we think it will be a game changer. Fill out a form below and send the referral resume to referral@employment-trust.com.